The film was theatrically released on 28 October 2005 in the UK and on 27 January 2006 in the US by Universal Pictures. Thompson also scripted the film, which is adapted from Christianna Brand's Nurse Matilda books. A sequel, Nanny McPhee and the Big Bang was released in 2010. The filming location is Penn House Estate, Penn Street, Buckinghamshire, England. In Victorian England in the 1850s, widowed undertaker Cedric Brown has seven unruly children. He is clumsy and loves his children, but since the death of his wife, has spent little time with them and cannot handle them. The children have had a series of nannies, whom they have systematically driven out by their bad behaviour. They also take great pleasure in terrorizing their cook, Mrs. Blatherwick. Besides their father, the only one the children will ever listen to is Evangeline, the family's uneducated but sweet-natured scullery maid. One day, Cedric discovers multiple references for a "Nanny McPhee" throughout the home. That same night during a storm, the children cause havoc in the kitchen at the same time Cedric sees a shadow behind the door and opens it to reveal a frighteningly hideous woman, who states that she is Nanny McPhee and is a "government nanny". With discipline and a little magic, she transforms the family's lives. In the process, she becomes more beautiful each time the children learn a lesson. Her warts and unibrow disappearing, her long tooth and oversized nose shrinking and her wiry greying hair becoming lustrous and auburn. The children, led by the eldest son Simon, try to play their tricks on her, but gradually start to respect her and ask her for advice. They change to responsible people helping their clumsy father in solving the family problems, making Nanny McPhee less and less needed. The family is financially supported by Cedric's late wife's domineering and nearsighted aunt Lady Adelaide Stitch, who demands custody over one of the children. She first wants Christianna (Chrissie), one of the daughters, but maid Evangeline volunteers and Adelaide agrees, assuming she is one of the daughters. She also threatens to reduce the family to poverty unless Cedric remarries within the month; the family would lose the house, and they would not be able to stay together. Desperate, Cedric turns to a vile and frequent widow, Mrs. Selma Quickly. The children assume from reading books of fairy-tales that all stepmothers are terrible women who treat their stepchildren like slaves; therefore they sabotage a visit of Mrs. Quickly, who leaves, angry at Cedric. After the financial rationale for the marriage is explained to the children, they agree to the marriage, and appease Mrs. Quickly by confessing they were to blame for the disturbance of her visit, luring her back to their father with tales of their Great Aunt Adelaide's wealth. However, the children soon discover that Mrs. Quickly is just as cruel and awful as any fairytale stepmother when she breaks baby Aggie's beloved rattle (which previously belonged to their late mother, and was the only thing they had left of her). When everybody is gathered for the marriage ceremony, they disturb the ceremony by pretending there are bees (inspired by the way Quickly told them to "behave" and baby Aggie repeating the word, but pronouncing it as "beehive"), chasing the guests, and throwing the pastries intended for the banquet at everyone present. Cedric swiftly understands that they do not like the bride and, recognising that he does not like her either, joins in the commotion himself. Mrs. Quickly cancels the marriage and storms off in anger. This seems to mean that Adelaide's marriage deadline is missed, but Lily asks Evangeline whether she loves Cedric. She first denies, explaining that it would be inappropriate because of her station as maidservant, but then confirms she does. Cedric, who loves Evangeline back, marries Evangeline then and there, satisfying Aunt Adelaide's conditions for maintaining his allowance; and Nanny McPhee (who is now beautiful), magically makes it snow in August, which transforms the wedding scene and changes Evangeline's clothes into a beautiful wedding dress, and restores the children's late mother's rattle for them. Nanny McPhee leaves surreptitiously, in accordance with what she told the children before on her first night: "When you need me, but do not want me, then I must stay. When you want me, but no longer need me, then I have to go". On 11 March 2002 Kirk Jones was hired and set to direct Nanny McPhee based on Nurse Matilda by Christianna Brand. Emma Thompson wrote the script for the film. Lindsay Doran, Tim Bevan and Eric Fellner produced the film with the budget of $25 million for release in 2005. On 22 April it was announced that Emma Thompson, Colin Firth, Thomas Sangster, Kelly Macdonald, Angela Lansbury, Eliza Bennett, Jennifer Rae Daykin, Raphaël Coleman, Samuel Honywood, Holly Gibbs, Celia Imrie, Imelda Staunton, Sir Derek Jacobi, Patrick Barlow and Adam Godley joined the film. On 16 May it was announced that Patrick Doyle would compose the music for the film. Development of the film was completed in Dorset, England. Filming ran April 1 - July 9, 2004. The film reunites Emma Thompson, Colin Firth, Thomas Sangster and Adam Godley who all previously starred in the 2003 film Love Actually. The film was theatrically released on 28 October 2005 in the UK and on 27 January 2006 in the US by Universal Pictures and was released on DVD on 9 May 2006 by Universal Studios Home Entertainment. Review aggregation website Rotten Tomatoes gives Nanny McPhee a score of 73% based on 134 reviews, a rating deemed Certified "Fresh" with an average rating of 6.7/10 with the consensus reading, "A bit alarming at first, Nanny McPhee has a hard edge to counter Mary Poppins-style sweetness, but it still charms us and teaches some valuable lessons." The film did well at the box office, earning $122,489,822 - $47,144,110 in the United States and $75,345,712 elsewhere. It premiered in the United States on 27 January 2006 with an opening weekend total of $14,503,650 in 1,995 theatres (an average of $7,270 per theatre) ranking at No. 2 (behind the Martin Lawrence film Big Momma's House 2). Emma Thompson revealed on Friday Night with Jonathan Ross that two more films were planned. The second film, Nanny McPhee and the Big Bang (also called Nanny McPhee Returns), was released in March 2010. It co-stars Rhys Ifans, Maggie Smith, Ralph Fiennes and Maggie Gyllenhaal. The character of Aggie Brown returns as the now elderly Mrs. Docherty. In it, Nanny McPhee takes charge of the children of a woman whose husband has gone to war. A third film was planned to be set in modern-day England but, despite taking $93 million at the box-office, the sequel under-performed to studio expectations and plans were cancelled for future films. 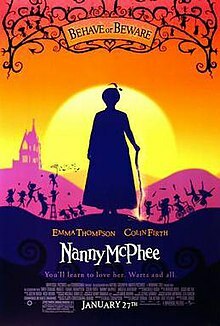 ^ a b c "Nanny McPhee (2006) - Box Office Mojo". www.boxofficemojo.com. ^ Nanny McPhee Returns on ComingSoon.net. Retrieved 16 January 2010. ^ "Emma Thompson Says There Won't Be a 'Nanny McPhee 3' - Movies With Butter". Retrieved 4 October 2014.